To say that April mean temperatures were near normal would not be newsworthy during normal times. But these are not normal times. In light of the five record warm months since last July, April represented a welcome reprieve from the recent trend. However, the drought situation has not improved from a status perspective, and has worsened from a prognostic point of view. 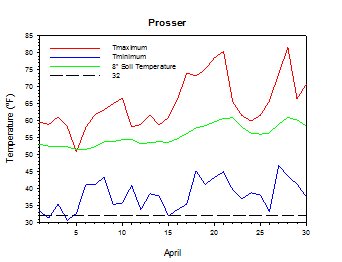 Overall, April was a dry month, which partly explains why Prosser's high temperatures were somewhat above normal, while low temperatures were near to slightly below normal. The relative lack of clouds and moisture allowed for sunnier and warmer days, and yet cool and stable nights. In fact, the mean low was slightly lower than it was in March, which is of course a testament to the warmth of March, rather than the chill of April. 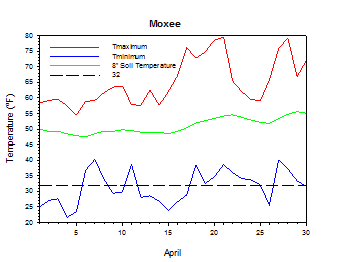 Interestingly, Moxee experienced a precipitation-free April. The first half of April was, amazingly, not that warm. There were even some days with below normal temperatures. 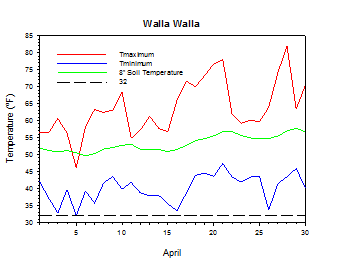 Highs around Walla Walla were only in the 40s on April 5th, and Broadview fell to a low of 20 degrees. Later in the month, the high temperature at Thorp reached just 49 degrees on April 12th, and the low at Ritzville on the 15th was 23 degrees. 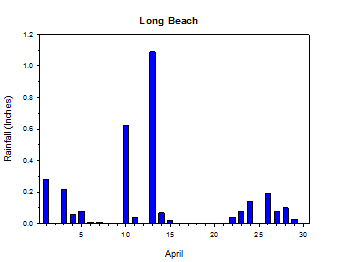 On April 13th, 1.11 inches of rain fell at Long Beach on one of the wetter days of the month. However, the second half of April was highly changeable. Azwell in north central Washington reached 83 degrees on April 20th, and then Garfield East reached only 47 degrees on the 25th, and Ritzville fell to 22 degrees on April 26th. Heat returned at month's end, as Vancouver reached 81 degrees on the 27th, and Benton City climbed to 86 degrees on the 28th. 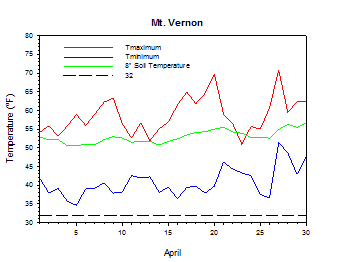 The weather was somewhat variable and rather cool during early April. Highs were generally in the 50s and 60s, with lows in the upper 20s to 40s. April 5th was a cool day for areas around Walla Walla that only climbed into the 40s, while Broadview started the day at just 20 degrees. On April 6th, the high was only 38 degrees at Green Bluff, as 0.53 inches of rain fell at St. Andrews. A front brought more than 0.8 inches of rain to some coastal areas on April 10th, as highs were in the mid 50s to around 70 degrees, and lows were in the upper 20s to 40s. Highs on the 11th dropped to the upper 40s to low 60s, with similar lows. The daily average wind speed was 20 mph at St. John. Lows were as cool as the mid 20s on the 12th, as moderate breezes continued in the east. Another front approached on April 13th, with highs in the upper 40s to mid 50s in the west, but 60s in eastern border areas. Lows were in the upper 20s to mid 40s. Rain fell in the west, including 1.11 inches at Long Beach, as southerly winds increased. The 14th was a cool, breezy, post-frontal day, as Garfield East reached only 45 degrees for a high temperature. The morning of the 15th was cold, with numerous 20s east of the Cascades. 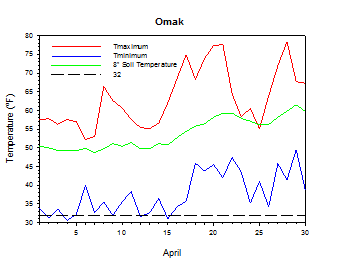 Temperatures warmed notably beginning on April 16th, as calmer and drier conditions prevailed. Aside from a weak storm passage early on the 18th, warm weather continued during the third week of April. Warm temperatures began the period, with a high of 83 degrees at Azwell on April 20th. Western highs cooled on the 21st, before eventually moving to the east, as slightly unsettled weather resumed. Highs on the 21st ranged from 54 degrees at Long Beach to 84 degrees at Desert Aire. Dayton NW recorded a 41 mph wind gust on the 22nd. Highs on the 23rd were again only in the 50s, except 60s in parts of central Washington. Lows were in the 30s and 40s. Rain fell in western areas, with more than a half-inch recorded at Tokeland. Cooler weather on the 22nd transitioned to much warmer weather by the 27th. Highs on the 24th were only in the 50s to mid 60s, including 49 degrees at Underwood. Rain fell in some western areas, as eastern sites were breezy. Garfield East reached only 47 degrees on April 25th, with lows in the upper 20s to 40s. There were isolated showers and gusty winds. Lows on the 26th were as cold as 22 degrees at Ritzville, though highs warmed to the mid 50s to 60s. Highs climbed to 81 degrees at Vancouver on the 27th, and to 86 degrees at Benton City on the 28th. 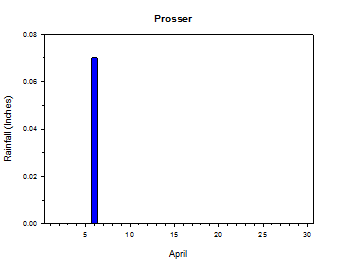 The average April temperature at Prosser (WSU IAREC) was 52.3°F, which is 0.5 degrees above average. The average high temperature was 65.2°F, which is 1.6 degrees above average. The average low temperature was 38.1°F, which is 0.6 degrees below average. The maximum temperature recorded last month was 81.5°F on April 28th, while the coolest daily high was 50.8°F on April 5th. 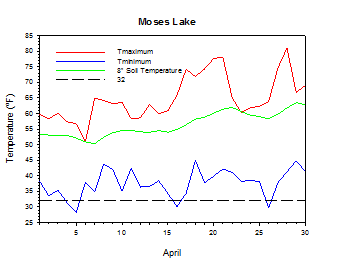 Low temperatures ranged from 46.8°F on April 27th to 30.7°F on April 4th. Daily average temperatures ranged from 64.0°F on the 28th to 41.9°F on the 5th. The monthly precipitation total was 0.07 inches. 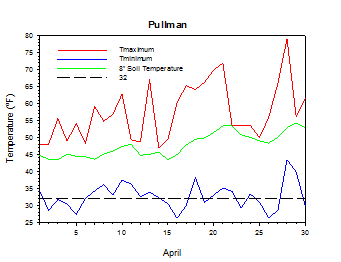 The average wind speed was 4.9 mph, and the average 8 inch soil temperature was 55.6°F. 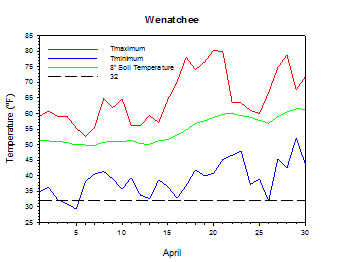 Wenatchee (WSU TFREC) recorded an average temperature of 52.3°F, which is 0.6 degrees above average, while Walla Walla's average monthly temperature of 51.8°F was 0.4 degrees above average. April 5th: The temperature at Pullman dropped to 27 degrees. April 13th: The wind at Royal City North gusted to 39 mph. April 14th: The high temperature at Garfield East was only 45 degrees. April 20th: The temperature at Azwell soared to 83 degrees. 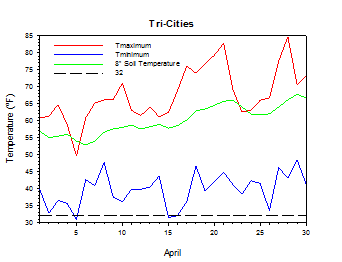 April 26th: The temperature at Ritzville plummeted to 22 degrees. April 27th: The temperature at Vancouver soared to 81 degrees. Cherries and apples were already at or near bloom in south central Washington as of the beginning of April (AWN). Chelan County was about 10 days ahead of normal, while asparagus harvest commenced in Yakima County. Dryland winter wheat was in fair to good condition, but more precipitation was needed. As of early April, Douglas County Extension reported straw breaker foot rot in winter wheat. As of mid April, less rain and warmer weather in western Washington created ideal fieldwork conditions. Dry conditions continued to be a concern east of the Cascades, and frost protection was needed on several nights. Isolated cold damage was reported in Douglas and Chelan Counties. The winter wheat crop also showed signs of cold stress. Otherwise, crop development continued to be ahead of normal, and fruit tree thinning began in the Lower Yakima Valley (National Agricultural Statistics Service). 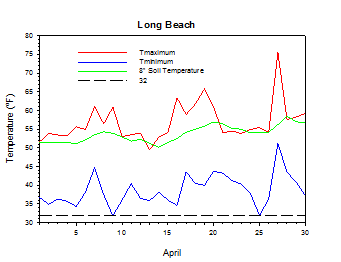 On April 30th, 2014, the temperature at Long Beach soared to a monthly record high of 88 degrees. According to the Climate Prediction Center, above average temperatures are likely during May, especially in western areas of Washington, along with near average rainfall in the east and below average rainfall in the west. 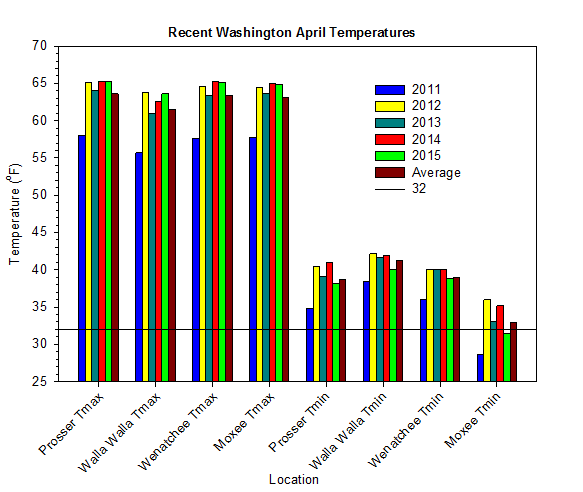 The signal for above average temperatures in Washington generally continues for the next 12 months. The odds are tilted toward below average precipitation for the mid-summer 2015 to early 2016 time period. El Niño conditions will likely persist and strengthen later in 2015.